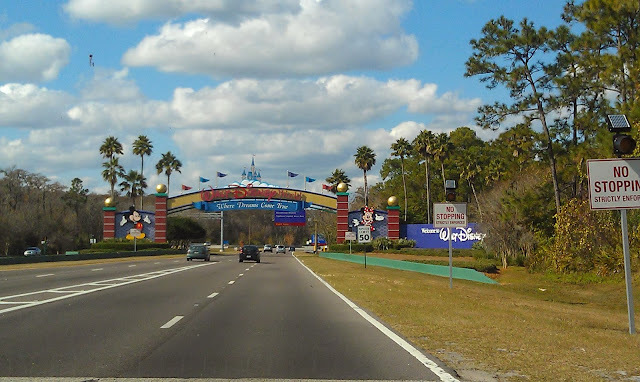 Disney Babies Blog: Hey, Where Are We? For months, we've been planning on our Thanksgiving trip to visit my parents, Grandma and Grandpa in Florida. Somewhere in that planning, we knew that we would meet up with our Louisiana "family" at Walt Disney World - my best friend from college and her family. This is our 3rd joint trip to WDW since 2010 and hopefully will continue annually or so. With Melissa being a teacher and us doing runDisney events, our trips can't always overlap, but we sure love when we do! We're raising our kids together, Disney style! Back to the surprise - Noah knew we were going on vacation. In fact, Noah knew we would be going to Florida. He just, luckily, didn't realize that Walt Disney World was on the way to Grandma and Grandpa's. The drive from Virginia is long. We stopped over night leaving only about 4 hours left the morning on our arrival, but we were all tired of being in the car and he was engrossed in movies. Until he noticed a "Mickey Bus" (Magical Express bus), we hadn't really seen any signs and the secret remained. Even when he saw the bus, he didn't really think too much about it. And, telling him we were getting to meet up with Piper, Melissa's daughter, who he had already asked to visit, really made his (and our) day! Have you surprised your loved ones? It was hard to hold this one in - and honestly, had he been older, he easily would have figured it out. BUT, I'm glad it worked out! And, keep checking back for more trip updates and new things I learned! Too cute. Glad he was surprised.